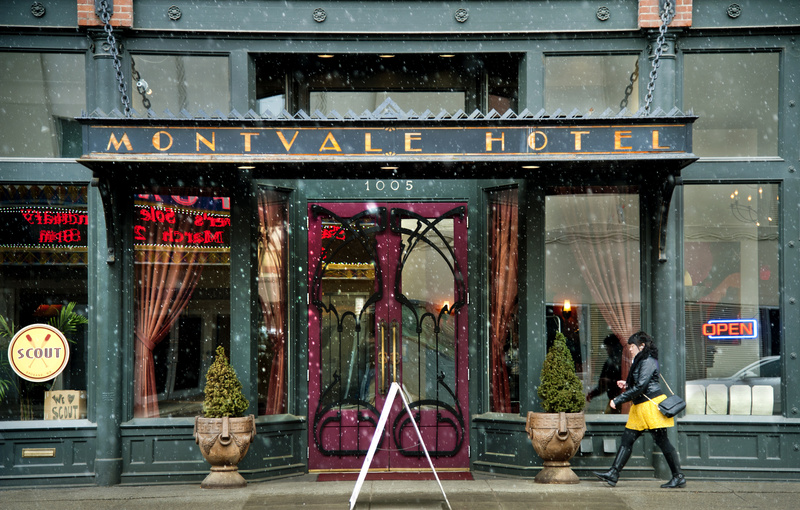 The historic 36-room Montvale Hotel in downtown Spokane has joined Jerry Dicker’s growing portfolio of boutique hotels and restaurants. Ruby Hospitality, the Spokane developer’s company, paid $2.3 million in a foreclosure sale last month for the 116-year-old building at West First Avenue and Monroe Street, in the entertainment district across the street from the Martin Woldson Theater at the Fox. Dicker said he plans to renovate the Montvale, expand the lobby, add a coffee shop and reopen a restaurant in the old Catacombs Pub space in the basement. He will keep the Montvale name. He said he and his wife, Patty, are passionate about art and historical preservation, and they plan to install art that is both contemporary and consistent with the historic feel of the hotel, which opened in 1899. Dicker emphasized style and art in his two other hotel projects, the Ruby and the Ruby 2, formerly a Rodeway Inn and a Ramada Express. He also bought and renovated the 100-year-old Bing Crosby Theater in 2011-12. In April, Dicker opened Ruby Suites furnished extended stay apartments in the former Burgan’s Furniture buildings three blocks north of the Division Street bridge. And he recently bought the two-story building formerly occupied by Dempsey’s Brass Rail bar at 909 W. First Ave. He is moving his company offices onto the second story and envisions an entertainment-related use of the first-floor space. The three-story Montvale will remain open during the extensive remodeling work, which could span one to two years and cost as much as $1 million, Dicker said. It will include restoring the original skylights and the decor and furnishings in the common areas and rooms, Dicker said. Guest rooms likely will be refurbished one by one, and all mechanical systems will be repaired. The lobby will be expanded into corner retail space and will include a coffee shop for hotel guests and the public. Scratch Restaurant and Rain Lounge probably will remain tenants on the first floor of the Montvale, Dicker said. Mauer Construction, a regular development partner of the company, will handle the renovation. Previous Montvale owner Rob Brewster filed for Chapter 11 reorganization in February 2013. He purchased it when it was mostly vacant and led a $3.5 million restoration of the building in 2004. A bankruptcy trustee tapped Hotel Market Solutions, a Spokane management firm, to run the hotel, which was saddled with more than $3 million in debts. Dicker spent more than 40 years in California developing large shopping centers and malls. He and his wife moved to Spokane in 2001 and took to focusing on smaller projects, downtown arts venues and community efforts that showcase innovation and smart design.